"TWO KAYAKERS ON CLEAR LAKE"
Medium: Acrylic on Canvas, Size: 8"x 10"
Medium: Acrylic on Canvas, Size: 8" x 10"
Medium: Acrylic on Canvas, Size: 8' x 10"
I have been showing paintings since 1989 at the Jessel Miller Gallery in Napa, CA. 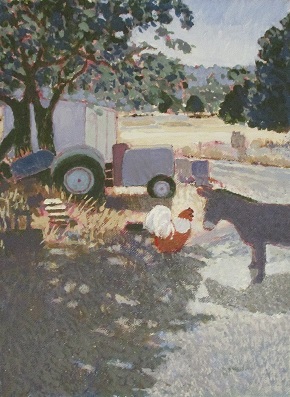 I have been showing paintings and sculpture at the Harbor Village Artists Complex in Lucerne, CA from 2009 to 2011. LAKEPORT WOMEN"S GUILD CRAFT FAIR 2018, KELSEYVILLE PRESPETERIAN CHURCH, KELSEYVILLE, CA. Second Saturday in Nov. Medium: Acrylic on Canvas, Size: 6"x10"
Medium: Acrylic on Canvas, Size" 8" X 10"
Medium: Acrulic on Canvas, Size: 8" x 10"